The son of the band’s late drummer John Bonham was behind the kit when vocalist Robert Plant, guitarist Jimmy Page and bassist John Paul Jones took to the stage in 2007 for their one-off reunion show in London, later documented on the DVD Celebration Day. And despite the fact Plant has spoken out on several occasions against resurrecting the group, who split in 1980 following the sticksman’s death, Bonham still feels it’s a distinct possibility. 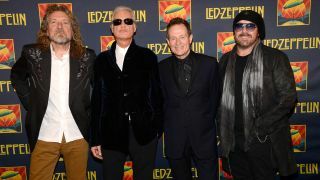 Earlier this year, Page talked down the chances of a Zeppelin reunion and revealed he’s planning a return to the stage in 2016. Plant reunited with Alison Krauss last month to record the track Light Of Christmas Day – their first material together since 2007 album Raising Sand.